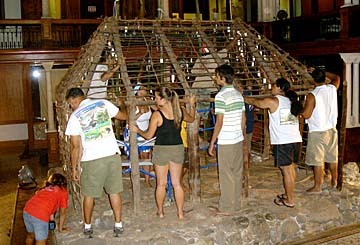 A photo shows the restoration of a Hawaiian hale at the Bishop Museum, the only one in existence that is double-thatched -- covered with pili grass on the inside as well as outside walls. Daniel "Pomaika'i" Kaniaupio-Crozier took apart a grass shack, or hale, at Bishop Museum and is now rebuilding it from scratch. But he must now find or grow the original materials, and then copy the methods of construction used by his ancestors. The 105-year-old replica of a grass house, or hale pili, will continue to be the centerpiece of the museum's Hawaiian Hall. The hall and nearby buildings are undergoing a $20 million renovation, to be completed in late 2008. Bishop Museum's project began in 2006 with the closing of the Hawaiian complex, which includes the main gallery or hall, Polynesian Hall, the Vestibule and Picture Galleries and the Kahili Room. The Castle Memorial Building, the Science Adventure Center and Planetarium are staying open to the public. "We will present things from the inside looking out, versus from the outside looking in" -- in other words, from a Hawaiian instead of a Western perspective, said Betty Kam, vice president of cultural resources. At 35, Pomaika'i has inherited a wealth of expertise from working at the side of his father and other kupuna since he was a boy. He is project director at the Hawaiian-language and cultural consulting firm the LeoKanaka Co. The framework of the hip-roofed hale was built before 1800, and the structure was moved from Milolii Valley on Kauai to the museum in 1902. It was reconstructed for $370; today's cost will run about $360,000. Pomaika'i is aided by "prayer that is constant; we're always asking for guidance" in figuring out how to best "respect the craftsmen who created the hale, the hands that made the structure. We ask for wisdom, knowledge and understanding," Pomaika'i said of his team of helpers. What he has learned through the dismantling of the hale has filled him with amazement at the ingenious techniques that indicate "a great foresight of resource management," he said. "It was awesome; we were blessed. We learned a lot ... This was a 'wow' house," Pomaika'i said. The hale is the only one in existence that is double-thatched, or covered with pili grass on the inside as well as outside walls, he said. Pili grass "was the Cadillac, or favored, cover grass" -- with its long, thin, fine blades -- because it was water-repellent and its life expectancy was the longest, he added. Because the source of pili grass is limited today "led us to research ... how many more fields of pili grass" must have existed in Hawaii in ancient times, and how much planning was required to ensure an ample supply, Pomaika'i said. Bundles of pili grass were uprooted instead of being merely cut off at the base so the builders could put more tension on the grass as they pulled it across the house frame. Because the museum will have to grow a lot of the grass, assembly of the hale will be delayed until the summer of 2008, Pomaika'i said. "We are facing the same challenges today as they did 100 years ago when they first restored it, such as the availability of original resources -- which have become even rarer -- and the financial constraints," he said. » Funding: $10 million has been raised -- half the renovation cost -- including $4 million from the state, $2 million from the Office of Hawaiian Affairs, $1 million from Princess Abigail Kawananakoa and grants from various foundations. » Designers: Ralph Appelbaum Associates is the planning and design firm heading the renovation. Mason Architects of Honolulu is assisting.